Hello Dealsnloot Readers,I Am Back With new Ebay Rs. 100 off on Rs. 300 .Ebay has again come up with it’s great offer where they are giving Flat Rs. 100 off on a minimum purchase of Rs. 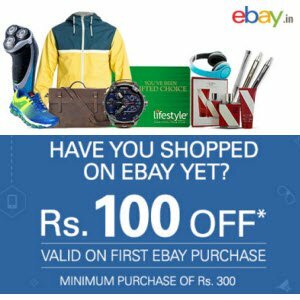 300 and above.Ebay has again come up with New offer Now Get Rs 100 discount on Rs 300 or Above Shopping at Ebay.in, Offer valid for New users only.So Grab Deal. How To Get 100 Off + 75 Off On Ebay ? So Basically You Will get The Rs.300 Product In Just Rs.125 With This 2 Combine Offers.